"They say that before you die your life flashes before your eyes. You think it's going to be the good stuff - every kiss, every party. Don't count on it. I was Bridget Duke - the uncontested ruler of the school. If keeping the wannabes in their place meant being a mean girl, then so be it! I never thought there'd be a price to pay. Until the accident. Now, trapped between life and death, I'm seeing my world in a new light: through the eyes of five people whose existence I've made hell. And I've got one chance to make things right. If I don't, I may never wake up again..."
I have to admit this was a good book. From the moment I read the blurb I was drawn in and it didn’t let me down. It’s a very different novel but a better word would be Unique. I mean I did like it, and it slots into the same genre as Before I Fall and If I Stay. The plot follows Bridget Dukes and she is the most popular girl at school. She is and will stay at the top of the triangle even if that means being the mean girl as well. Basically another girl comes along and she feels threatened and she has a car accident and she gets stuck in Limbo where she has to spend time in the life and mind of five people’s lives she made a misery. It’s a very light plot for something relatively deep. It focuses in on the sort of things that matter to teens and the sort of issues they can have because as well as being worried about popularity the book also focuses on self consciousness about the way people look, bulimia and anorexia and hints on bullying. The plot was relatively good but I did feel that was slight too much repetition in it, but who cares about that. The point is that I enjoyed the book. I mean after all the mean (some may say EVIL) stuff Bridget does the lesson or message is a good one. I mean the book has some really good messages in it for anyone. Also the emotions are very good. I mean when Bridget is mean to her Step Mum you can really feel her Step Mums hurt. As far as favourite characters go I liked Michelle. She should’ve have been in Bridget’s Place was kept on being put down by Bridget and the rest of the school after the crush incident. 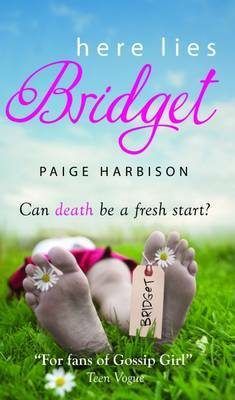 I found that I didn’t particularly like Bridget. I found her very cold and very shallow. I mean was she so apparent she couldn’t she any fault or wrong in her actions. She was horrid until the end where I suppose she learnt. The writing was very light and airy I suppose. It was very fun and easy to read, and I finished it within a two hour car journey. It’s definitely a debut novel; there’s no denying that. Now you see what I want to know is will there be a sequel, but I wants one! Honestly though this was an amazing book so, go read it!